Quitting the GOP: Team Hellreich quietly lost yet another R to the D's. . .
yet another R to the D's. . . Since the RINO leadership of the Hawaii GOP stubbornly and deceptively refuses to tell you how much they are screwing up, please allow HIRA to break the following 'turncoat' news to you. Approximately two months ago, yet another Republican quietly bailed on the Republican Party to join the ranks of the Aloha State's Democrats . Following in the footsteps of party-switcher state legislator Aaron "Ling" Johanson is Maui county councilman Don Couch. Yes, Team Hellreich was able to keep this story under wraps until now. 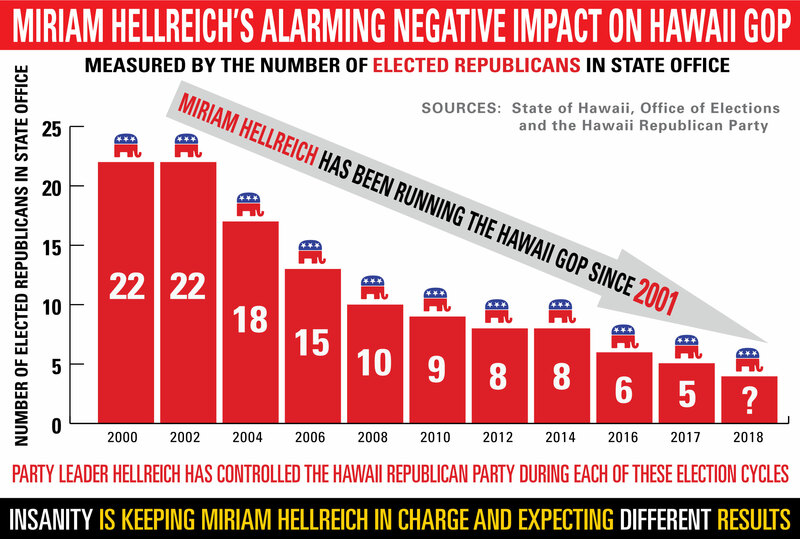 A friend of HIRA's on Maui (a former party leader on the Valley Isle, in fact) tipped us off that Team Hellreich has frightened off yet another one of our few elected Republicans on Hellreich's watch. 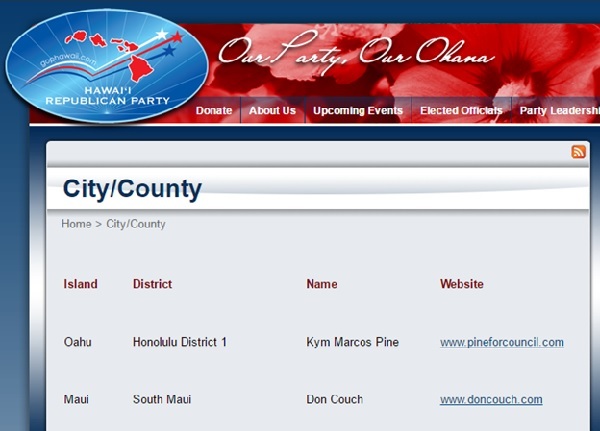 The Hawaii GOP's website used to list Don Couch alongside Kymberly Pine-Ryglowski (a.k.a. "Kym Marcos Pine", her 'stagename', never her legal name) as elected county officials with the Republican label. 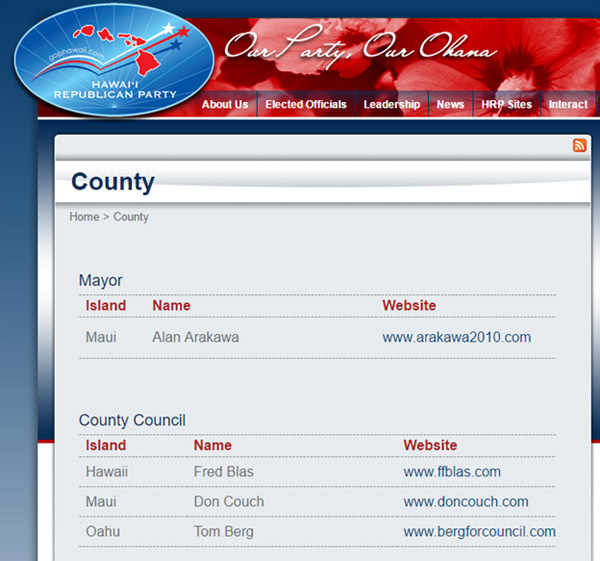 But like Maui Mayor Alan Arakawa who also used to be listed as a Republican on this page, their names quietly vanished without explanation. Look now and their names would all be gone (except for HIRA's screenshot below from a few years ago). 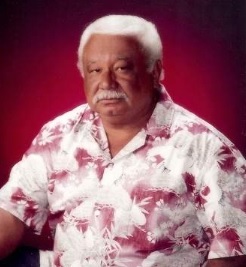 The tip off came in the form of an October 2nd letter to the editor to the Maui News entitled "Council Member Don Couch represents Democratic ideals" from an activist Democrat from Wailuku, Maui named Jonathan Starr . 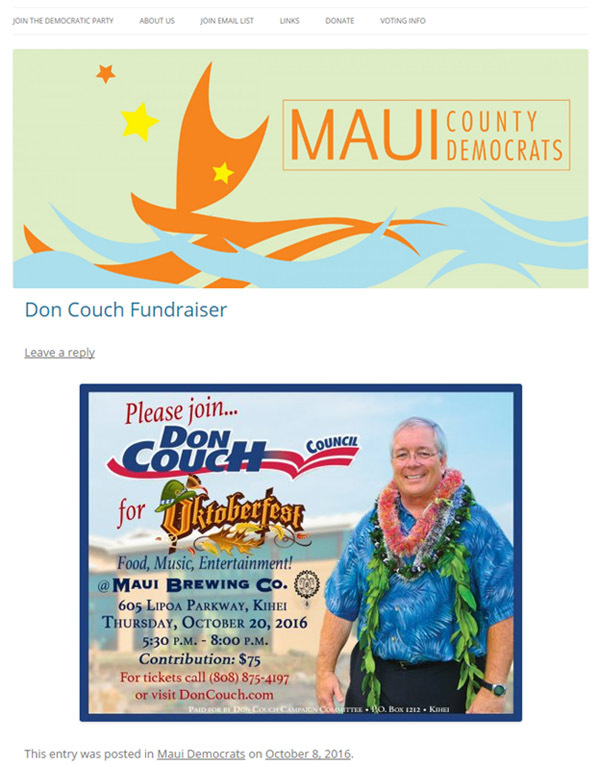 The opening line of the letter reads: "As a longtime Maui Democrat, I am pleased that County Council Member Don Couch recently joined the Hawaii Democratic Party." OMG!! 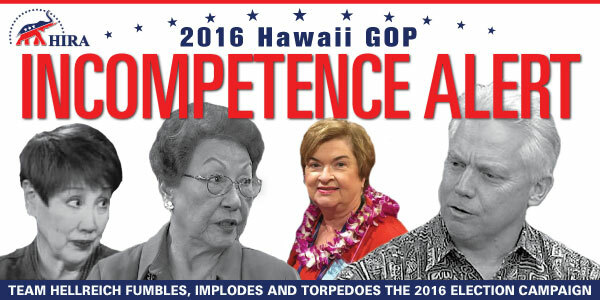 Well that tidbit deserves a bit of research on the state of our Hawaii GOP. But it gets worse. 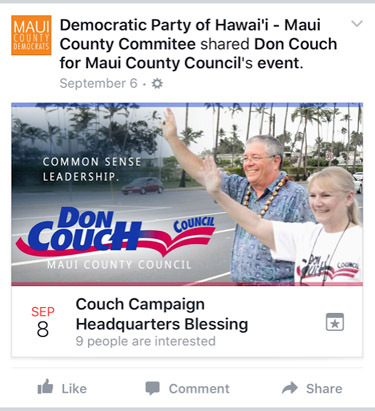 On September 6th, the Maui Democrats were already promoting Don Couch's campaign HQ 'blessing'. This means that Team Hellreich and Puppet Rohlfing have kept us in the dark about Couch's defection for nearly two months ( if not longer). 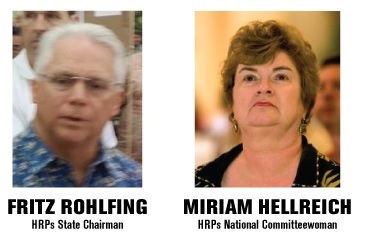 Even Big Island county council member Fred Blas (yet another name which disappeared from our party's website of elected GOP officials) had nothing good to say in an interview with the West Hawaii Today newspaper about the difficulty of working with the Hellreich-run Hawaii GOP. Tom Berg (now Libertarian) . 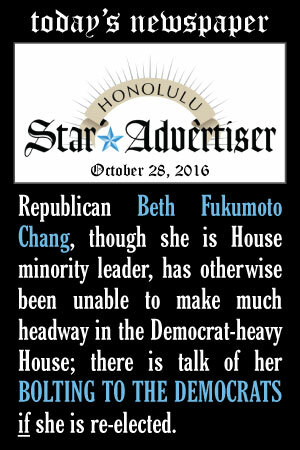 Today's Honolulu Star-BirdCageLiner newspaper reminds us that Mililani RINO state house member Beth Fukumoto is probably next (if she gets re-elected) to ditch the Hawaii GOP for the Democrat Party . . . following in the footsteps of her political soulmate and mentor/defector Aaron "Ling" Johanson. "Ling" Johanson, of course, is the soft-spoken closet Democrat who made history by switching parties as the ONLY LEADER of a Republican caucus in any state legislature to bail to the other side -- and who did so RIGHT AFTER THE 2014 ELECTION. With RINO Fukumoto serving (at the pleasure of a split 4-3 vote of her GOP colleagues) as the current GOP leader in the State House of Representatives, Republicans statewide are preparing for another seismic event since Fukumoto has repeatedly and clearly signalled that she might do the exact same thing as "Ling" following the 2016 General Election. With such lukewarm 'Republicanism' exhibited by Fukumoto -- who routinely supports the progressive agenda of higher taxes, wasteful spending, drivers licenses for illegal aliens, the rail boondoggle, etc. 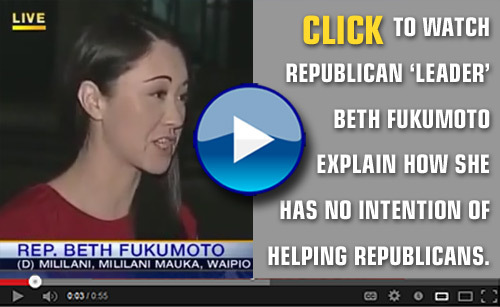 -- you might be wondering WHO exactly would have been the GOP house leader all this time had Windward Oahu RINO Feki Pouha not switched his organizational vote at the last minute to Beth Fukumoto. 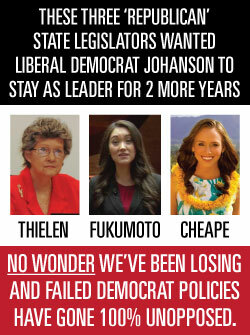 The answer: West Oahu's GOP state representative Andria Tupola, who faces a well-funded, multi-union-backed Democrat named Stacelynn Eli -- and whose backers are similar to those of Beth Fukumoto (Carpenters, Firefighters, HSTA unionized government teachers, Plumbers & Pipefitters, HART officials). Campaign donors like those should tell you what's really at stake in Election 2016. And THAT is why, as HIRA has written about extensively, Beth Fukumoto would be welcomed with open arms by the Democrat Party if/when she bails. So with Fukumoto once again becoming best known as a reluctant Republican who likes voting with Democrats and hates, hates, hates Donald Trump, watch HIRA's video and see for yourself why it would be NO GREAT LOSS if and/or when Fukumoto crawls into bed with Joe Souki, David Ige, and Colleen Hanabusa. And that's the sad state of the party under Team Hellreich. Thanks again for taking time to understand the battle Republicans face here in Hawaii. We've really got to rescue our party from the RINO's before we have any hope of taking on the Democrats. To this end, MAHALO for your financial support for HIRA and to our official SuperPAC HIRA Action. And many thanks to those of you stepping up to volunteer with HIRA to fix the party in 2017. Once again, best wishes to all GOP candidates on the ballot in 2016. P.S. It's time to give state and local Democrats and their liberal media cheerleaders something to get upset about -- and you CAN by supporting HIRA Action with your donation of $20 or more today. Â Mahalo!